If you are a Star Wars fan, there is a lot to like here, and a lot to forget. It’s not a terrible movie, but it’s not a great one either. It’s just an average film in a Universe that should be filled with A+ material. There are no doubt countless stories to be told in the densely rich Universe of Star Wars. Its iconic characters, as well as its fringe ones, are household names beloved by generations. After exploring the destinies of a group of unknown rebels in the highly acclaimed Rouge One, the Disney machine churns out an enjoyable, if unnecessary, introspective into one of its most celebrated characters - the legendary Han Solo. True to George Lucas' vision of a hot rodding ne'er-do-well , we're introduced to Han on his homeworld of Corellia in a speeder chase reminiscent of Harrison Ford (the original actor to play Han Solo) in American Graffiti (a pre-Star Wars Lucas' film, starring Ford). This... might not be the Han Solo you are looking for, however. Ford, who has played the character since 1977, is, of course, absent in this pre "New Hope" era, replaced by Alden Ehrenreich (Beautiful Creatures). His performance in the title role is admirable. These are big shoes to fill and while he's not "the same Han Solo", Ehrenreich does enough to put his own spin on the role and make it believable. Questions fans have about the backstory of Han Solo are answered. How does Han team up with the Wookie "Chewbacca"? Who gives Han Solo his name? Where does he get the Millenium Falcon? What the hell is a parsec? Beyond these questions, the answers to which are satisfying, the overall plot and story arc of the film is somewhat bland and uninspiring. It's doubtful this movie would exist if it didn't have "A Star Wars Story" attached. That said, it's an entertaining film and not without its merits. There are some great performances, most notably Donald Glover (The Martian) as the freewheeling space pirate Lando Calrissian. His relationship with Han that we see portrayed in the original trilogy is cemented with a tongue in cheek exchange from the writers "I hate you..." "I know...". The supporting cast does a serviceable job but many of the characters are forgettable and disposed of early in the film. Chewbacca, the loyal Wookie companion to Han, gets his time to shine in the film as well. We see his power, strength, resolve and character development as he helps Han and forges the unbreakable bond we see in the original and sequel trilogies. Being "Star Wars", there are a number of special effect set pieces which really shine. From a video game-esque dual rail train scene to numerous space chases in the Millenium Falcon, the look and feel of the film is vintage Star Wars and at the top of its class. There are a few surprise cameos which seem to be forced in a way. It's a "whoa" moment for sure when one of the prequel characters shows up via hologram, but the film is neither made better or worse by it. It falls flat and the casual fan probably doesn't really care either way. Presented in 2160p with a 2.39:1 aspect ratio Solo: A Star Wars story never truly utilizes the full 4k technology at its disposal. Even with UHD, colors are dark and muted and despite the added relation, the textures are not very sharp and clear. Having been shot natively in this format it is a shame the production didn't translate through to the 4K transfer. 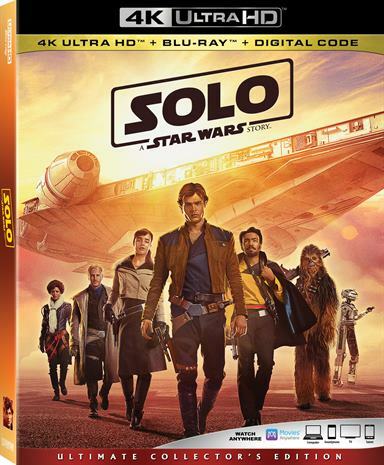 Solo: A Star Wars is encoded in Dolby Atmos as well as Dolby TrueHD 7.1, and while the video transfer was a bit of a letdown, the audio is simply mind-blowing. The Dolby Atmos track makes great use of the height speakers and you feel like you are literally in the world of Star Wars, taking a ride on the Millennium Falcon with Chewie and Han. Solo: The Director & Cast Roundtable: Director Ron Howard sits with Alden Ehrenreich, Donald Glover, Joonas Suotamo, Emilia Clarke, Phoebe Waller-Bridge, Thandie Newton, Woody Harrelson, and Paul Bettany to discuss their roles and working on the film. Kasdan on Kasdan: Writers Lawrence Kasdan and his son Jonathan talk about working on the film together and discuss working on the franchise. Remaking the Millennium Falcon: Take a look at the re-creation of the famous ship and the importance of its role in the franchise. Escape from Corellia: In this feature, we take a look at the opening chase scene of the film and take a look at Han Solo's place in the "Star Wars" universe. The Train Heist: This feature takes a look at the train heist scene and design of the train itself. Team Chewie: A look at the relationship between Han and Chewie. Becoming a Droid: L3-37: A look at Phoebe Waller-Bridge's performance of this character as well as the character itself. Scoundrels, Droids, Creatures, and Cards: Welcome to Fort Ypso: This feature takes a behind the scenes look at this location in the film and a look at the card game that was played during the scene. Into the Maelstrom: The Kessel Run: A deeper look into this iconic scene and everything that went into creating it. If you are a Star Wars fan, there is a lot to like here, and a lot to forget. It's not a terrible movie, but it's not a great one either. As a stand-alone film, void of the "Star Wars" Universe, this one gets a grade of C-. Taking into context all that surrounds it and how it fits into the overall franchise a C+ grade seems appropriate. And that is the real problem. It's just an average film in a Universe that should be filled with A+ material. Download Solo: A Star Wars Story from the iTunes Store in Digial HD. For more information about Solo: A Star Wars Story visit the FlickDirect Movie Database.